At Mobileye, we developed Road Experience Management (REM) technology to crowdsource the maps needed for AVs – what we call the global Roadbook. We are now harnessing those maps to improve the accuracy of ADAS features. An example of this is the work that Volkswagen and Mobileye are continuing in their efforts to materialize a L2+ proposition combining the front camera and Roadbook technologies, and leveraging the previously announced data harvesting asset. The ongoing development activity is targeting a broad operational envelope L2+ product addressing mass market deployment. A good example is our new partnership with Ordnance Survey, one of the world’s most sophisticated mapping agencies. By equipping utilities fleets with our retrofit system Mobileye 8 Connect, we will both map the United Kingdom for the AV and offer our first data services product to those utilities companies. Imagine if, instead of having to jump through bureaucratic hoops for months on end and rely on outdated imprecise information in order to drill a simple hole in the ground, the process was quick because using our REM data you could easily map the underground assets to the corresponding over-the-ground landmarks. This example suggests tremendous promise for an entirely new set of uses for the technology we’re developing for AVs and helps deliver on the smart city promise. 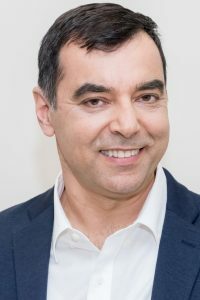 Photo Caption: Mobileye President and CEO Prof. Amnon Shashua shows off the EyeQ5 SoC during Intel Corporation’s news event at CES 2019 on Jan. 7, 2019, in Las Vegas. The EyeQ5 is Mobileye’s fifth-generation system-on-chip for advanced driver assistance systems and automated driving solutions. It is now in production with design wins totaling 8 million units. It comes as Mobileye is fostering a developer ecosystem to expand application development for the EyeQ platform. (Credit: Walden Kirsch/Intel Corporation).